Almost immediately after I teamed up with Jess for her *bespoke* magazine, I discovered Love Mae and fell head over heels for their work. This Aussie duo creates the most beautiful fabric wall stickers, wallpaper, and now dinnerware. I don’t know anyone who wouldn’t want a little piece of their work in their home. When I reached out to them, I never in my wildest dreams imagined Emily and Peta would actually let me interview them! So get ready for a truly amazing interview with the team behind Love Mae. Mae turns 4 soon, so its been quite the journey. Some days it seems that it was only yesterday that a couple of us met up and fantasized over the idea of working for ourselves creating gorgeous products. Originally we planned on doing wallpaper, cushions, and lampshades, which is why we use so many patterns in our decals. Once we entered the world of Love Mae, inspiration came from everywhere and soon our fantasy was alive. I still can’t believe how much we’ve learnt and where Love Mae has taken us. The biggest challenge was doing the things that took us out of our comfort zone. Between us all we had loads of skills, but so much we had to learn along the way. Trying to have a professional front when you are not feeling professional is super awkward. We still face challenges every day, but now we know that the quicker we tackle them, the quicker we can move back onto the fun stuff. Our first trade show! It was mind blowing what we achieved. It was also the moment that we all came on board full time and could proudly say that we worked for ourselves. It was great to stop the juggling and start the joy. We’ve since done trade shows in Sydney, Melbourne, London and New York. I think the travelling is sometimes my favourite part. Every day! Doubt is such a negative force and can sometimes take extreme measures to shift. Doubt can hinder intentions, so its really important to decipher between doubt and real instinct. There is so much to achieve and so little time so work time is best being productive. There is so many things I yearn to achieve, but I make the time everyday even if it is five minutes to open another part of me. I’m self taught with most things in my life, so study is the next big thing I’ll achieve. Always. Creativity comes and goes. I definitely think it is so closely linked with confidence. When I’m feeling uninspired I take a moment to myself and walk on an empty beach or enjoy a moment on Pinterest. It quite quickly comes back, but you’ve got to be so careful not to be hard on yourself. I love the cliche Rome wasn’t built in a day… but usually substitute Rome with Love Mae. I’ve got two little girls, 4 and 7, so balance is just as much an artwork as Love Mae. I never wanted to work for myself and lose my time with children so I take this balance challenge on as much as I do anything else. My morning involves getting children ready for school and pre-school.. packing lunches making breakfast. I usually arrive at work around 9.30. A day in the studio is so dramatically varied I never really know what will happen. The only thing I know is the times I need to pick my girls up. I then do the homework thing, play and craft time dinner and baths and books and bed. Most nights I must admit I find my way back to my laptop where the work continues again. I don’t mind this and I make sure I keep the night work interesting. I do remind myself that it will always be there tomorrow if I don’t feel like working. A good thought is … ‘whats the worst than can happen if I don’t get it done’. This usually keeps it real for me. In the early days, communicating with good blogs. We really can thank the blogging world for our success… that and our launch pad, Etsy. 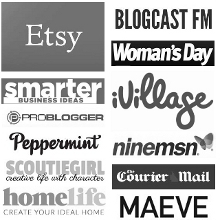 Bloggers are direct into the homes of our favourite market… New mums! We now have a PR agent and she’s amazing. I must admit I now have a lot of nights off not having to worry about getting our images out there. A PR agency was a great move! Keep a balance. You can’t always do just the fun stuff and be successful, especially in the early days. Enjoy being out of your comfort zone. Life is about learning and keeping both sides of the brain alive. Set yourself goals and then break them down to bite size pieces. Keep your ‘to do’ list real and achievable as you are always your biggest critic and if you are not achieving your weekly list you’ll soon talk yourself out of your own success. You can do this! I’m a big ‘future goal’ setter! I love a big picture. In 5 years I see myself in a bigger warehouse with dedicated staff all wonderful in their area of expertise. I like to think I’ve created a lovely work place where we have a rule… life and family come first. I’ve got so many ideas and they will probably take 5 years to all come to fruition. But definitely Love Mae will be grandeur with lots of new pretty goodies available. I’m excited.